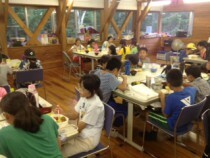 We had a big menu: salad, fried chicken, sautéed eggplant, potato salad, miso soup and fish! 3 students cooked 60 fish on the BBQ! Thank you!